Ducting is a necessary component in many jobs requiring full ventilation set ups, and with Air Systems International at intech Equipment and Supply you have a one stop shop for all of your breathing air and ventilation needs. 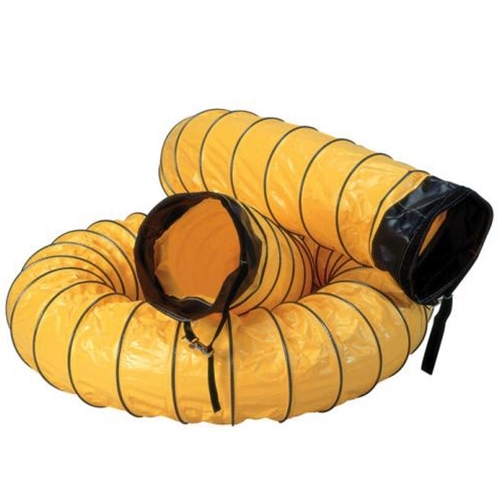 The SVH-25 is standard yellow ducting, 8 inches in diameter and 25 feet in length. Featuring 6 inch attachment cuffs at each end of the hose, the SVH-25 is easy to connect with adjustable straps as well as additional full accessory line up. For confined space work and more, this standard ducting is built tough using a vinyl polyester blend with internal steel wire reinforcements and external wear strips – Even available in completely custom sizes. Rated for use in up to 180 degree temps, and bright yellow to alert other works and avoid damage, the SVH-25 is a great addition to any set up. Air Systems International also provides duct to duct connection pieces, as well as adapters to enlarge or reduce and meet any transition size. Our pros here at Intech can assist you in accessories, custom orders and more. Choose from connectors in polyethylene or galvanized steel, as well as carriers, alarms and other add ons for breathing air ventilation equipment. Put three decades to work for you by selecting Air Systems International at Intech Equipment. Manufacturing and design experience coupled with quality materials and excellent pricing allow you to select the equipment you need without availability and budget limitations. From completely custom orders to standard selections, cover all your bases and stay under budget. Shop online, by phone or visit us at one of our locations across the U.S. Replace old ducting or start new right here at Intech Equipment and Supply. Shop all the top manufacturers for PPE and breathing air equipment from the comfort of your home or office today!